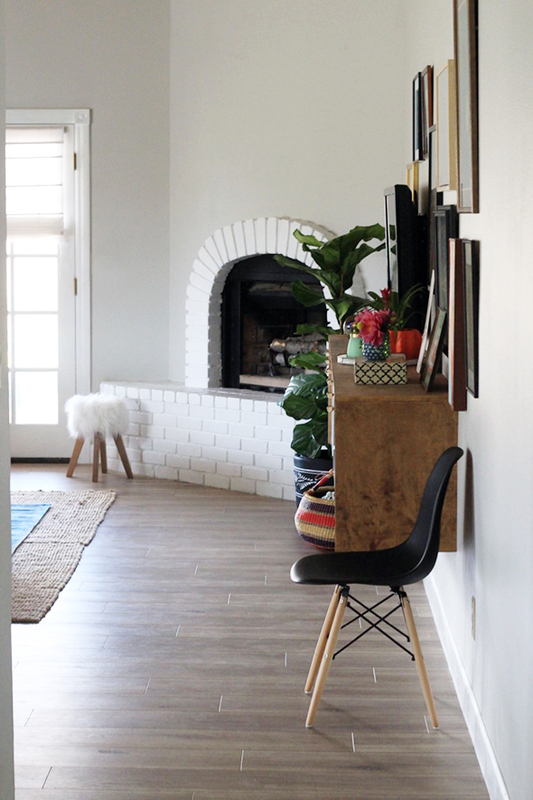 Their home has a pretty open layout, so we set out to pick a laminate flooring option that not only looked beautiful in their living spaces but that could go in the kitchen and bathrooms too. 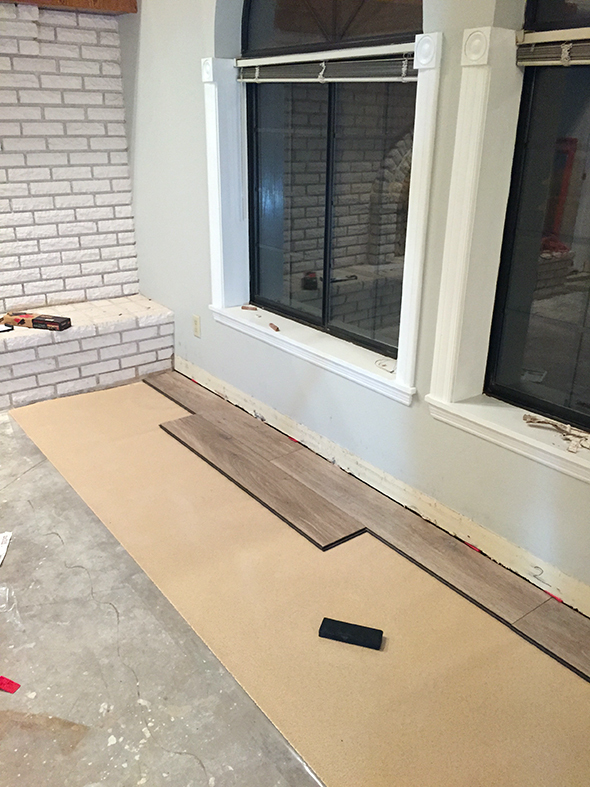 They needed about 2000 sq ft of flooring for these main areas, so we also wanted something affordable. 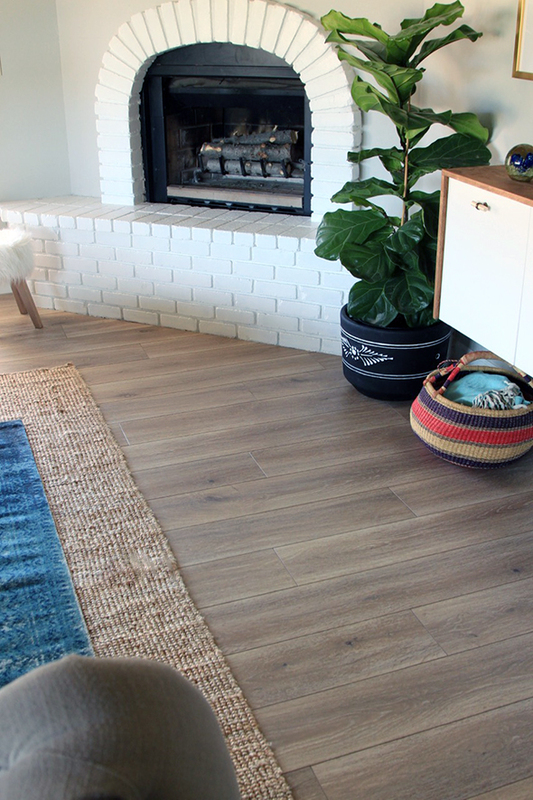 After this post on my favorite wood flooring picks from Floor & Decor, Ali and TJ started researching Aquaguard as a serious option. They really loved the price (only $2.99/sq ft!) 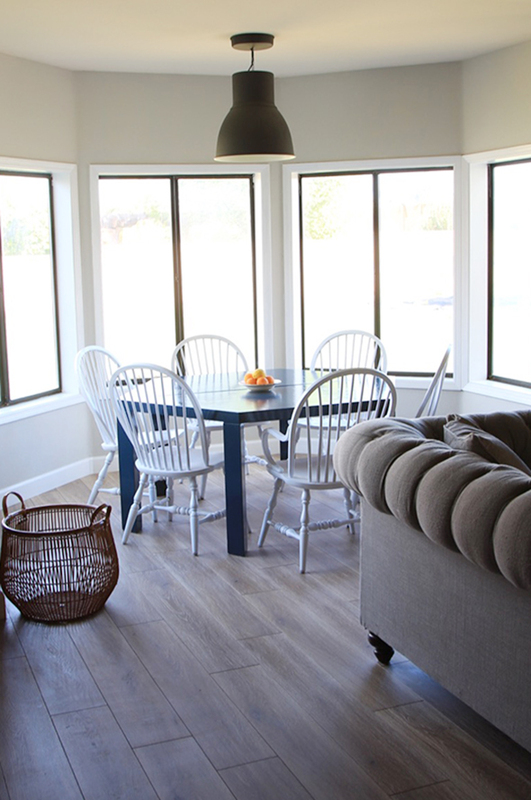 and the color (they chose the Calico stain – a grayed brown midtone), but they were especially excited by the idea of their laminate being water resistant! After ordering a sample plank and testing it every which way by gauging it with nails, scratching it with a knife and then letting water sit on the plank for days at a time, we were all VERY impressed with how the Aquaguard held up to the abuse! The material itself feels so solid and well-made, but the color and pattern also are very forgiving! We picked up the laminate and let it sit (still boxed up) inside the house for a few days to acclimate while working on prepping the floors. 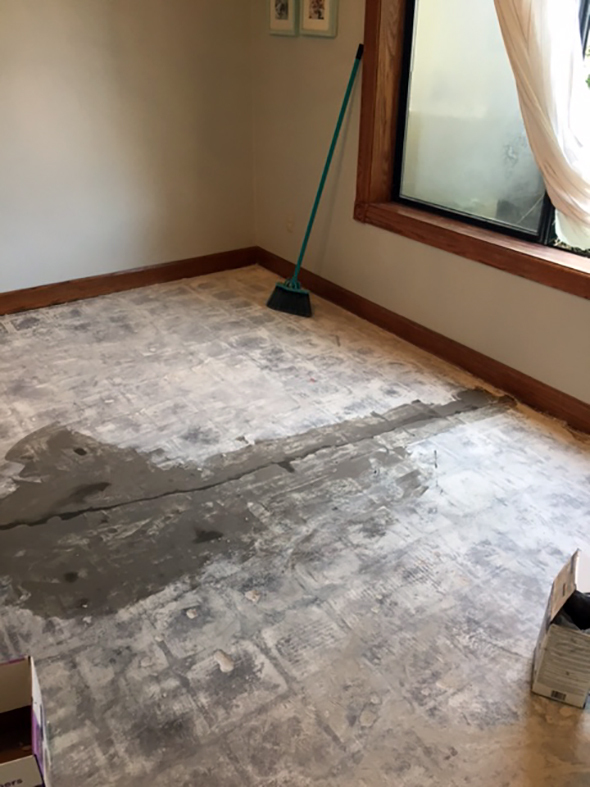 All the tile demo and carpet removal actually took more time than the flooring install! 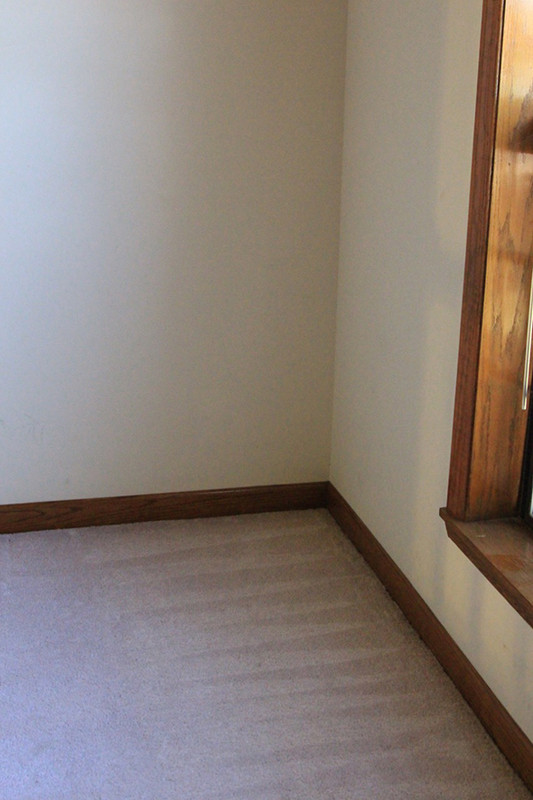 Ali also patched the concrete cracks and divots with FeatherFinish and removed all the baseboards, which were later primed and painted bright white! 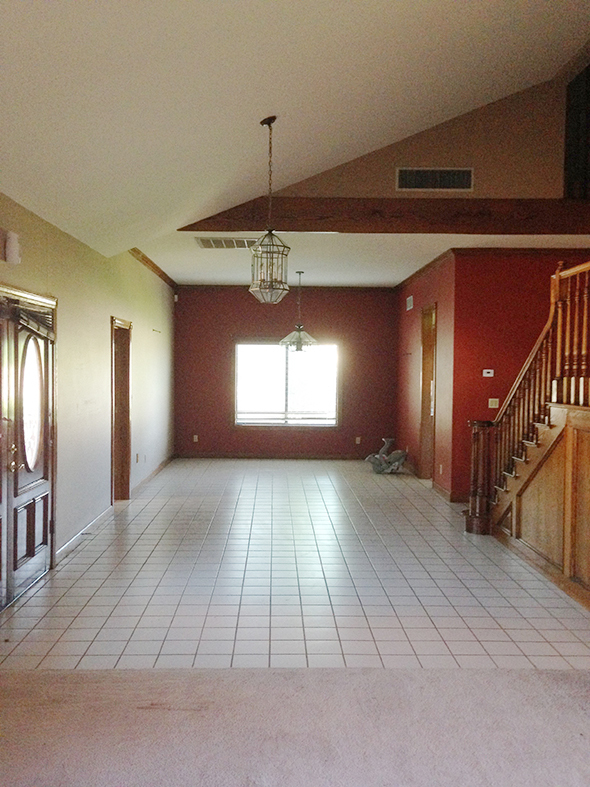 The paint change alone made an ENORMOUS difference in the look and feel of the house! Ali and TJ also decided to invest in a really great, eco-friendly underlayment. Floor & Decor has this cool sample stand in their stores where you can tap a golf ball on the same flooring with different underlayments and its insane how much of a difference there is between the different underlayments and their sound-masking levels! There is absolutely no tapping or swooshing sound when you walk on these new floors! 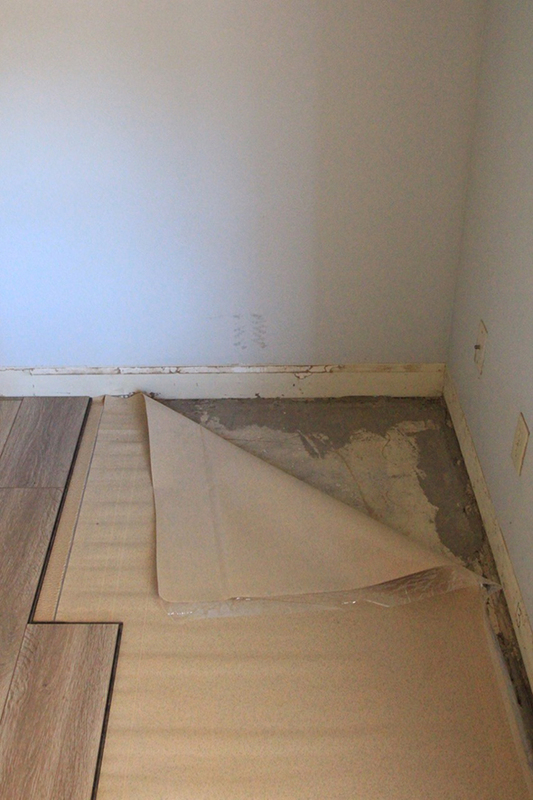 Another great thing about this particular underlayment is it comes in smaller rolls, which is incredibly DIY-friendly! 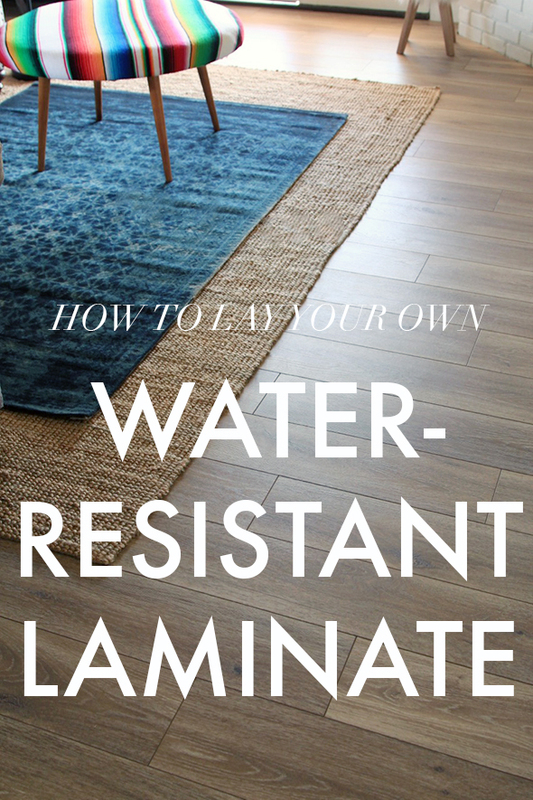 Those huge, bulky rolls can be hard to manage but this one’s really easy to use – you just roll in out, lay a few rows of your laminate on top and then connect another layer of underlayment with the clear sticker adhesive strip. It couldn’t be simpler and I love that you don’t have to deal with any crazy glue! 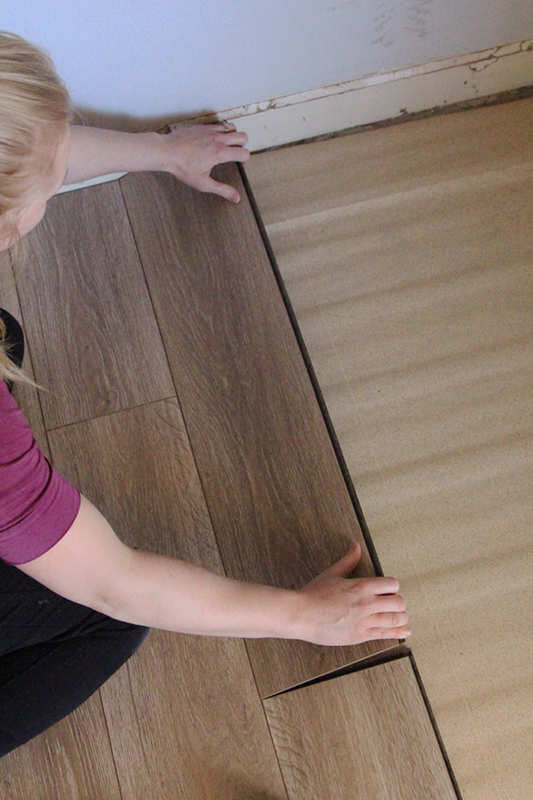 The Aquaguard laminate itself is also incredibly simple to install. 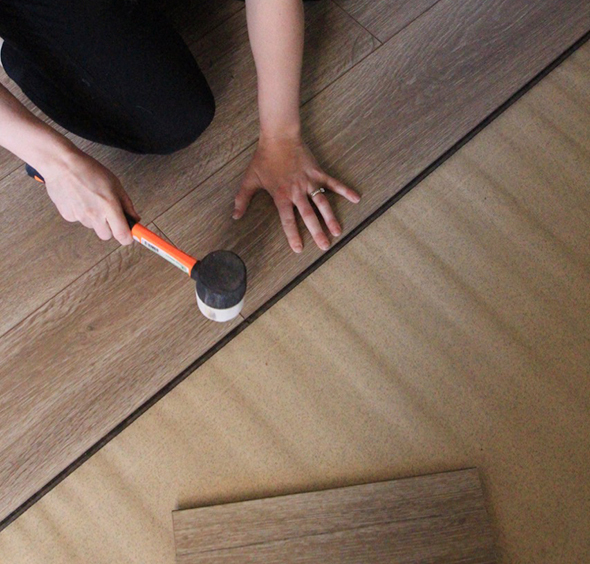 You just come in with the plank at an angle, line up the grooves until they sort of settle and click and then you lay the plank down and tap it into place with a rubber mallet. AND THAT’S IT!! 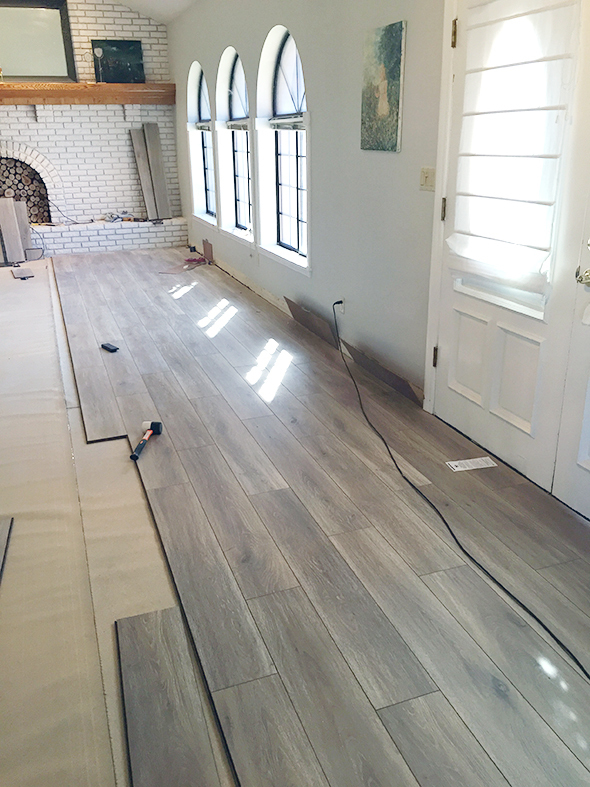 The only part maybe that is time-consuming is doing all the end cuts, but that’s going to come with every type of flooring install. 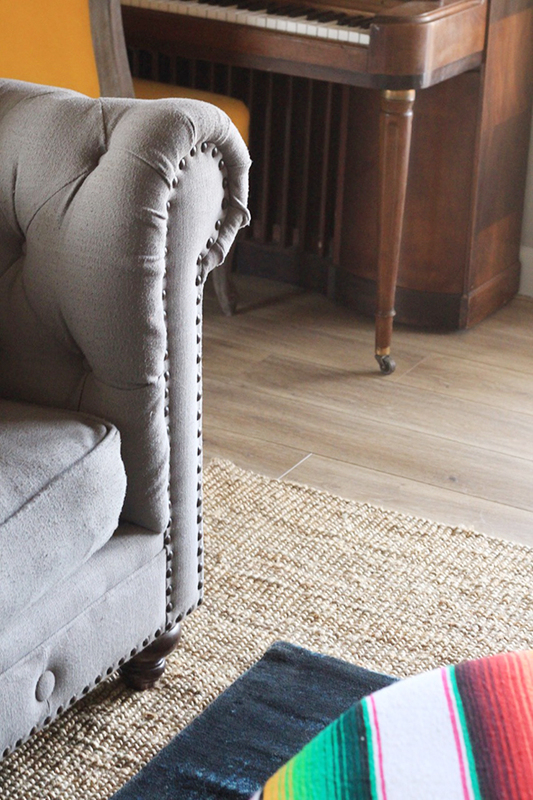 And also like with other wood plank flooring, you’re going to want to stagger the planks so the seams are random. If you’re not careful about this, a pattern will start to emerge in the seams and you likely won’t be happy with the look. 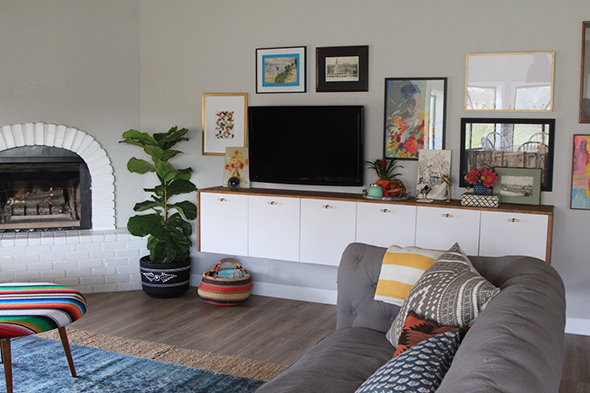 Here’s the finished look in Ali’s family room and breakfast nook! Doesn’t it look so light and pretty in here? 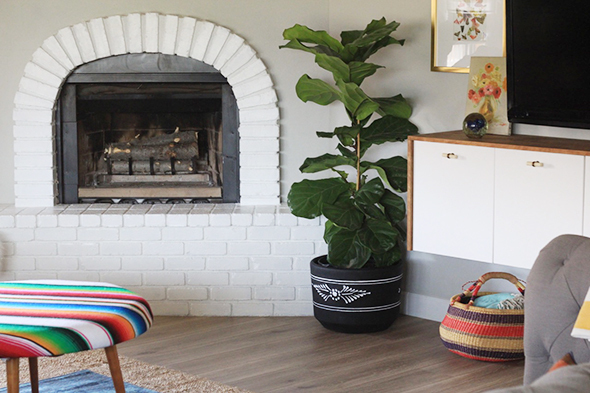 Between the Aquaguard laminate and the bright white trim and fireplace, it feels like a brand new house!! 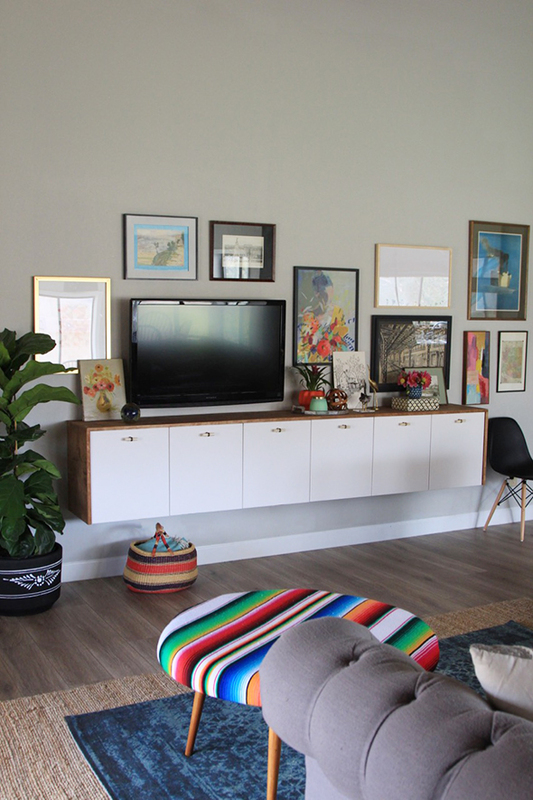 I also love how the “Calico” color of the floors mixes with other wood tones in the room, like their piano, the wood paneling on the ceiling, the floating credenza waterfall and even the legs of the ottoman we upholstered with a serape. 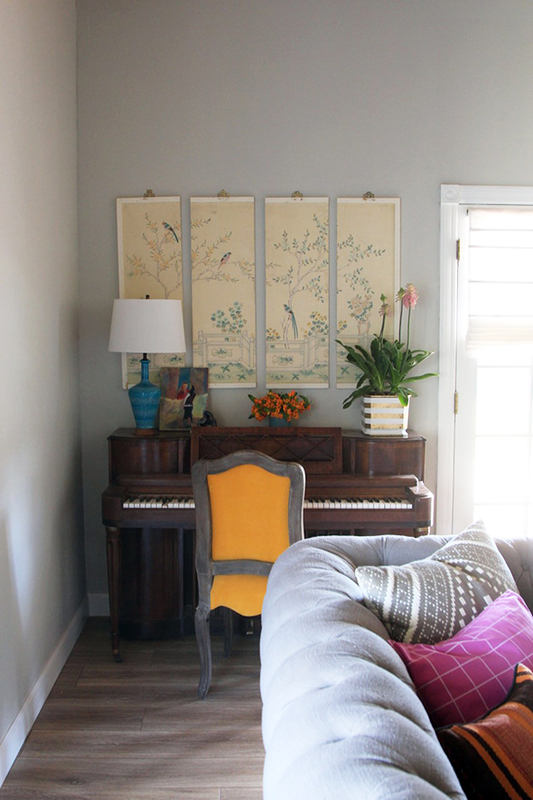 It’s an amazing stain color that goes with everything! 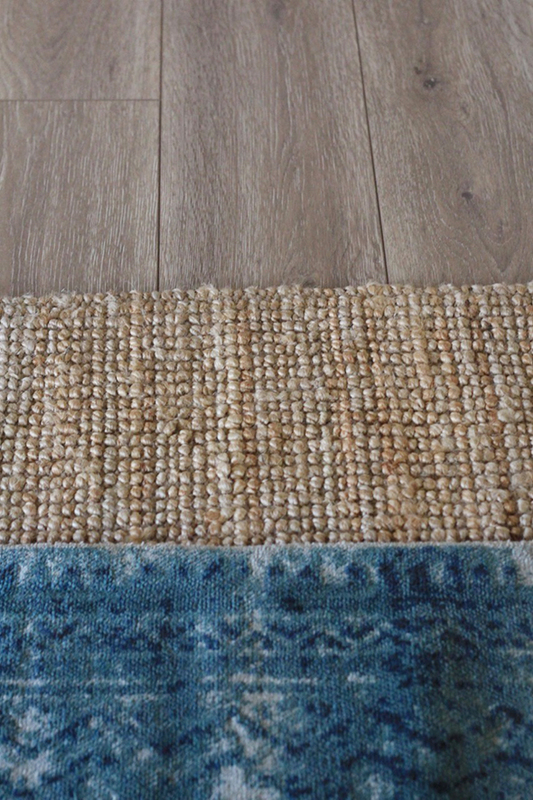 I also love how the floors look with the layered rugs! 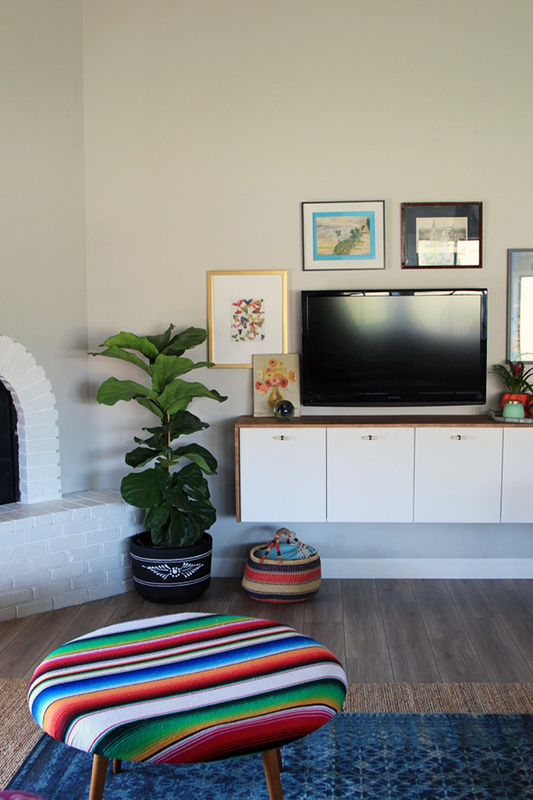 We bound two IKEA jute rugs together and layered this 5×8 Loloi rug on top. Aren’t the colors amazing? I love the overdyed pattern. Floor & Decor is a well-loved partner of LGN! All opinions are my own. 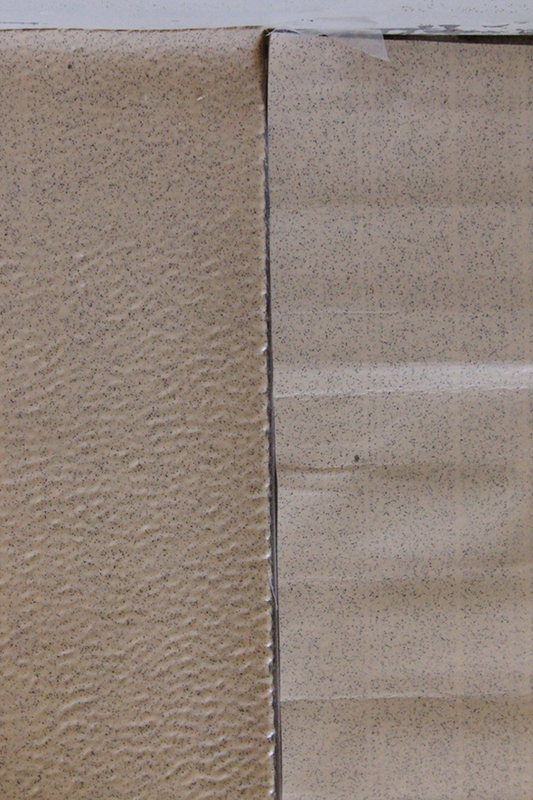 Can I ask how the aquaguard laminate has held up after a few years? Looks beautiful! 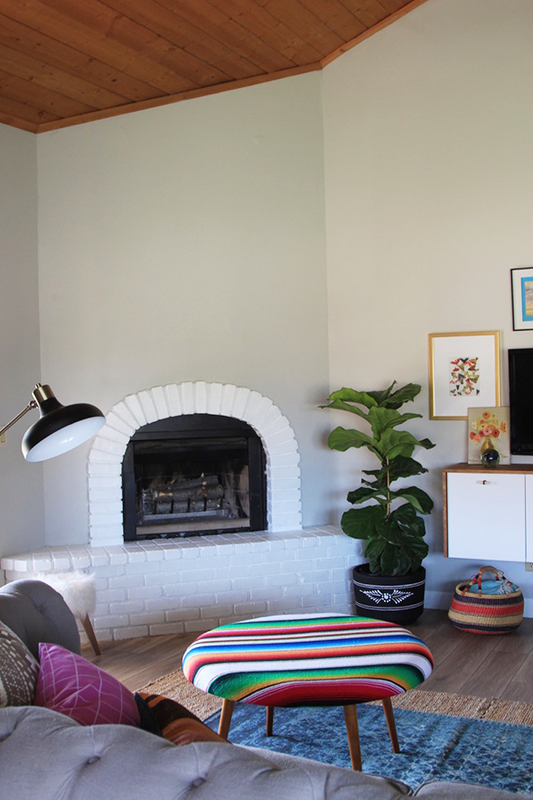 Also, brilliant idea to bind the two IKEA rugs! I’m going to try so many of your tricks! It looks beautiful how has it help up over the years? I am looking at options for new flooring and googled aquagaurd flooring reviews and you popped up! 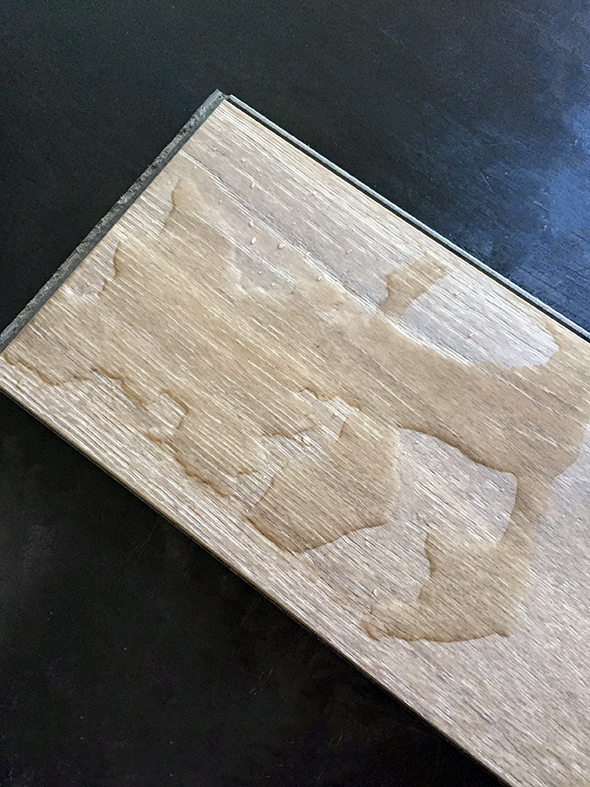 I am also curious if you could do a follow up review of how these floors have held up, any tips or opinions if you would pick this water resistant laminate again etc. Would love to hear about how it has held up? 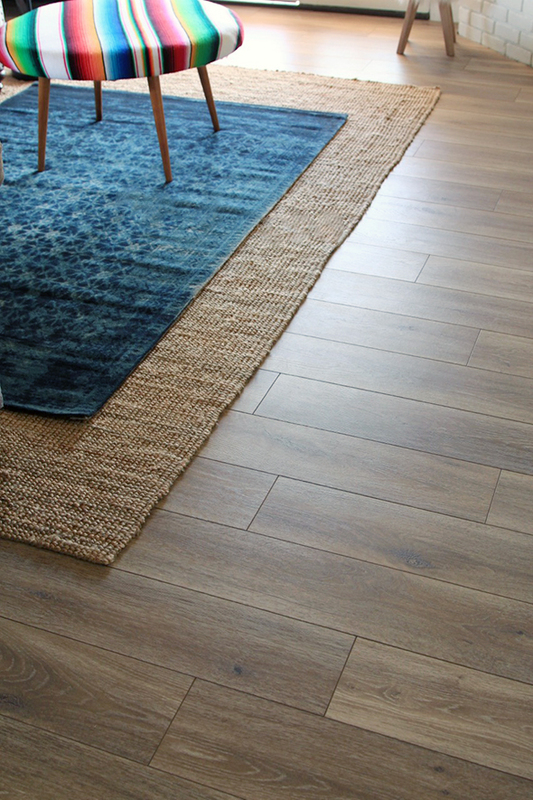 we have purchased both the Aquaguard from Floor and Decor and a Hickory Creek H2O from Pro Choice Flooring in Ft Worth. They have been down for last 16 months in various rent houses. Amazing quality! Highly recommend this type of flooring. just make sure you get the black one with the black backing and not the fake one from Pergo. What is the name of the aquagaurd you selected? How did the floor hold up? Beautiful!!! I want to do this to my home. 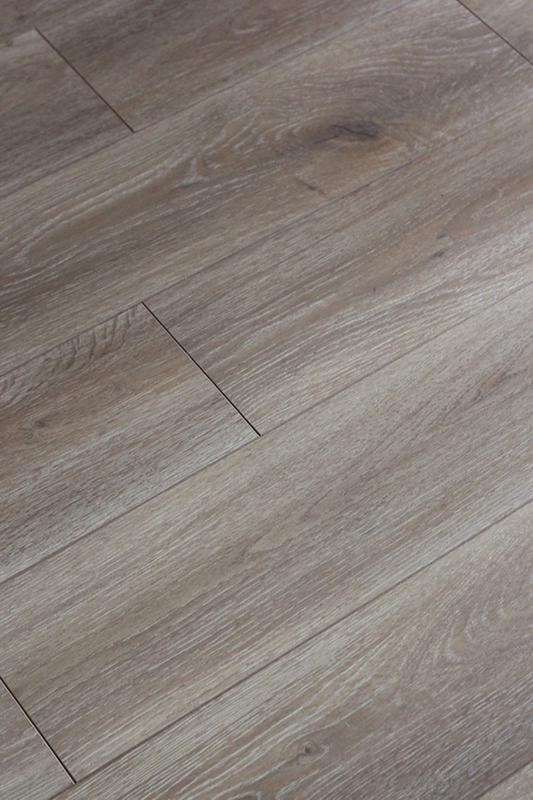 I want to put this type of flooring through my home, but want waterproof, not water resistant. 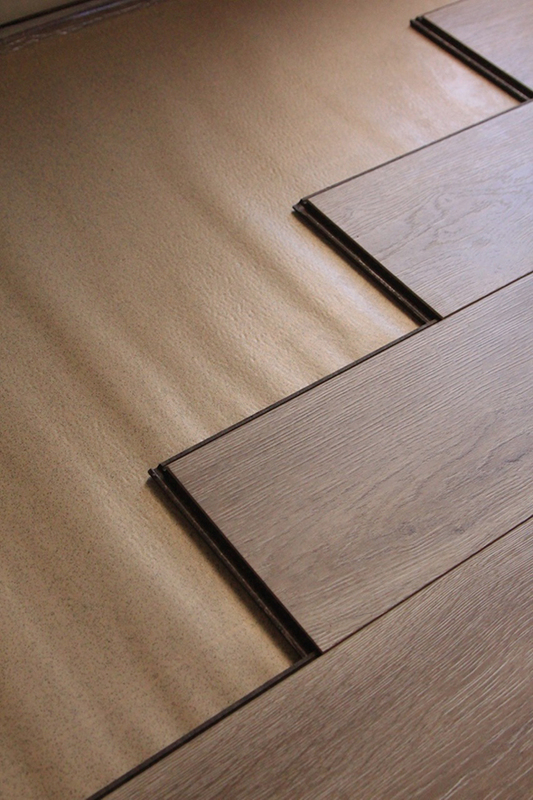 What is available on the market in waterproof flooring.